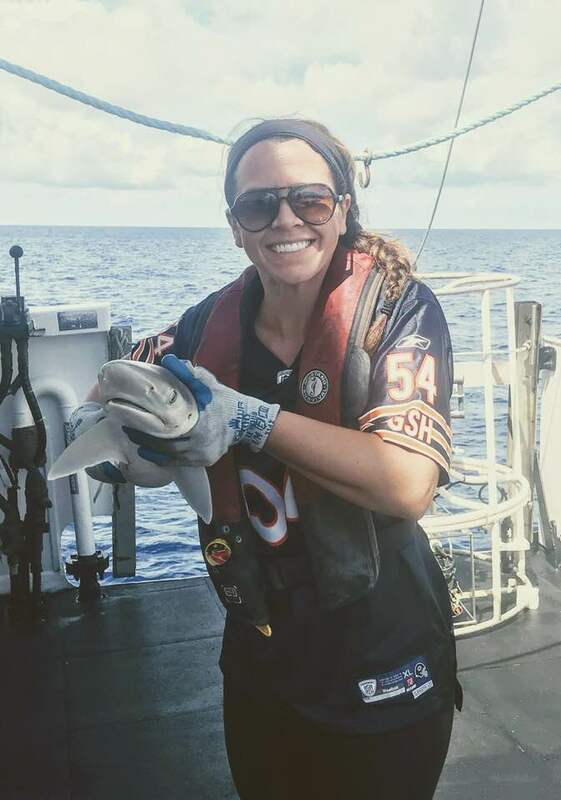 In addition to collecting data on the many species of sharks in the Gulf of Mexico, this survey also collects data that will go towards assessing the population of red snapper (Lutjanus campechanus). 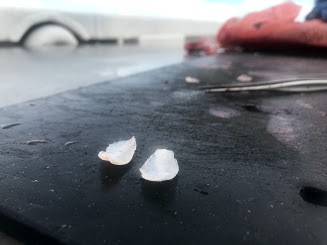 One piece of evidence that is collected from the red snapper is their two distinct otoliths. 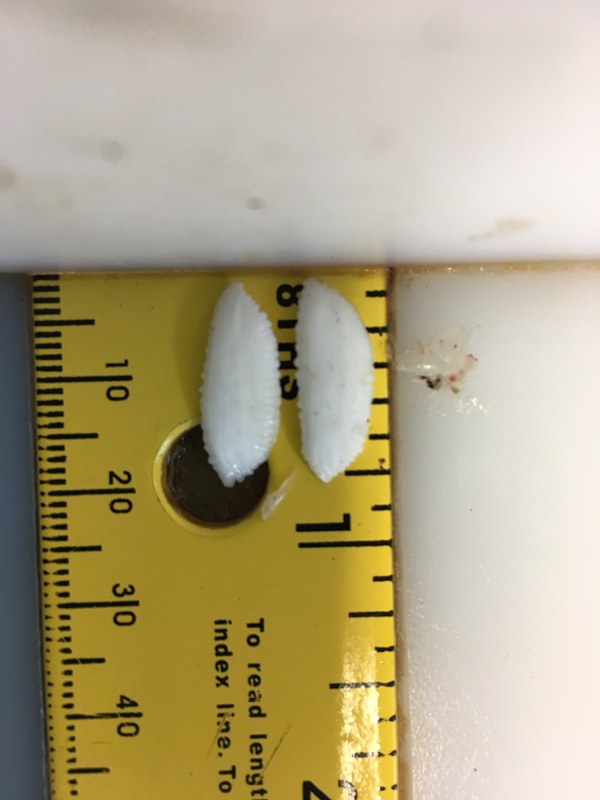 Otoliths are structures that are used for balance and orientation in bony fish. 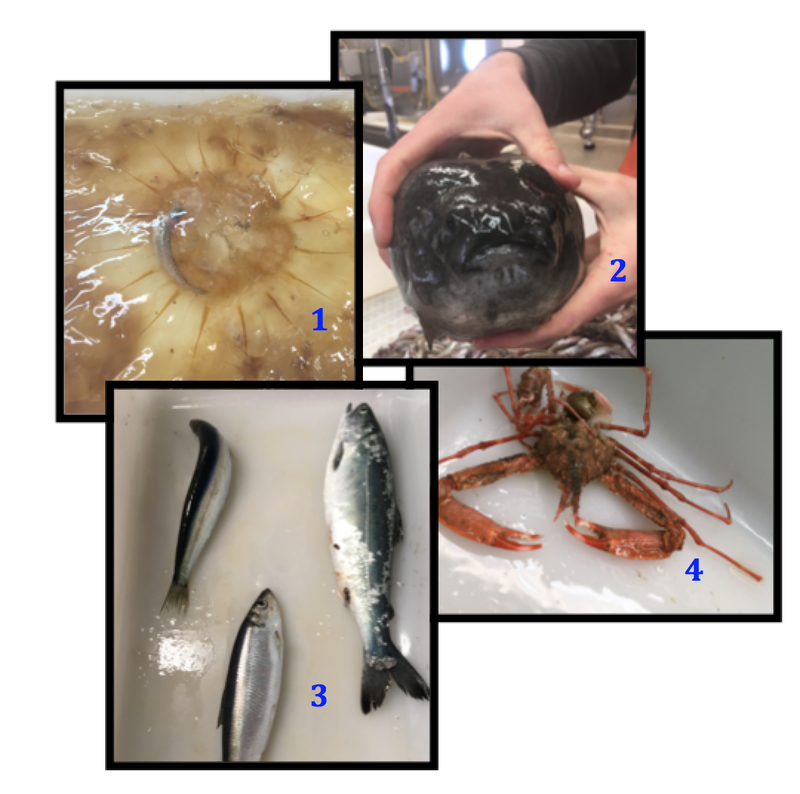 One fascinating characteristic of the otolith is that they contain natural growth rings that researchers can count in order to determine the age of the fish. This information is important for stock assessment of the red snapper in the Gulf of Mexico. I would have to say that the hardest part about being out at sea is not being able to see Coral and Kai. I miss them so much and think about them nonstop. Coral is at a very curious stage in her life (I hope the curiosity stays with her forever) and I cannot wait to get home and tell her about all the animals that I have been lucky enough to witness on this adventure. Kai is just the sweetest little boy and I can only imagine the way he will react when I get home. 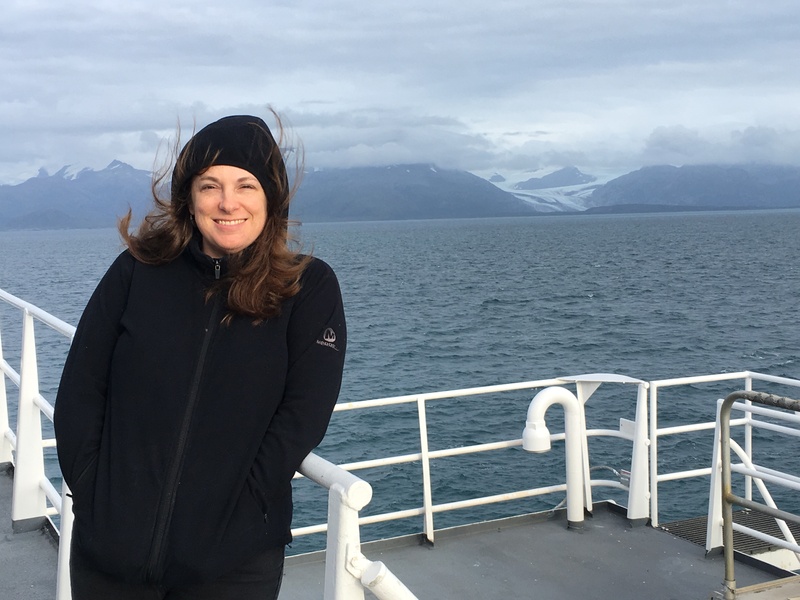 I am very busy on the boat and when there is down time my team and I are getting shark lessons from the incredibly intelligent Chief NOAA Scientist, Kristin Hannan, or we are in the movie room catching up on all the Annabelle movies. It is almost impossible to get scared while aboard a ship. It may seem that many things could go wrong, but the lights are always on and someone is always awake. It is the perfect environment to watch any horror film because this atmosphere makes it much less scary. Probably the scariest thing that is happening on this boat is the amount of weight I have gained. All of the meals are delicious and they come with dessert. It is kind of nice to not have to worry about going to the gym or staying on a normal routine. Life is always so hectic day to day when I am at home, but being out here on the water gives me time to relax and reflect on the amazing people I have in my life that made this opportunity possible. I am sad to report that the Chicago Bears lost tonight to Greenbay, but I did show support for my team! I think the best part of the day was when I was on the bow of the boat and Kristin announced over the radio that the Bears were winning 7 to 0. It is exciting being out here seeing everyone cheer for their fantasy team, as well as their home town team. 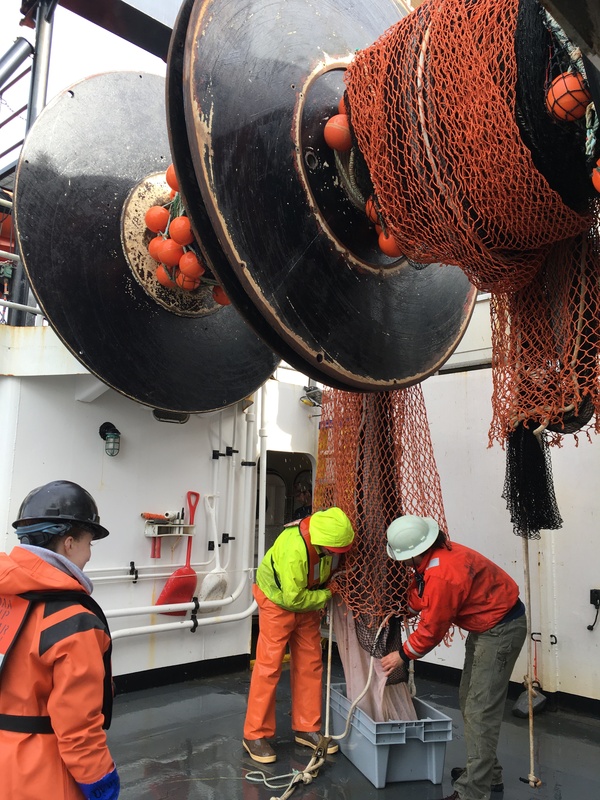 As fish traps begin to be brought up by the deck crew, scientist wait to see what may be in the trap. I’ve actually found that I am looking over the deck in anticipation of new fish that may have been caught, or to see how many fish will need to be “worked up.” Once the fish have been removed from the trap and emptied into a large bin, they are then sorted by species into 17-gallon bins to determine the total weight of all fish. 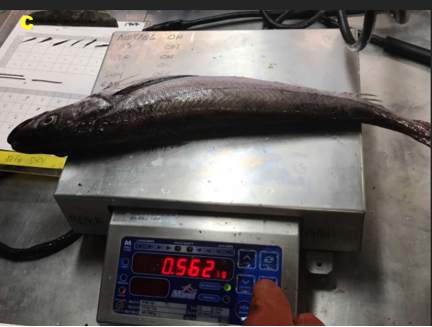 Moving 17 gallons worth of fish up to the lab bench to the scale can be quite a “work out.” There have been a couple of hauls that have captured so many fish of a particular species that more than one bin has to be used. 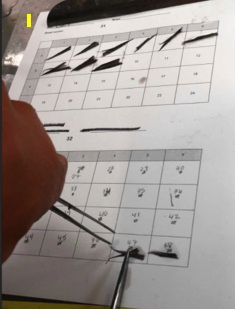 After the fish have been weighed, the total length of each fish is determined to get a length frequency of the entire catch. 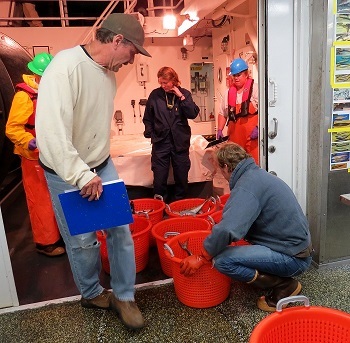 For species like Tomtate (Haemulon aurolineatum), every fish is measured and then returned to the ocean. 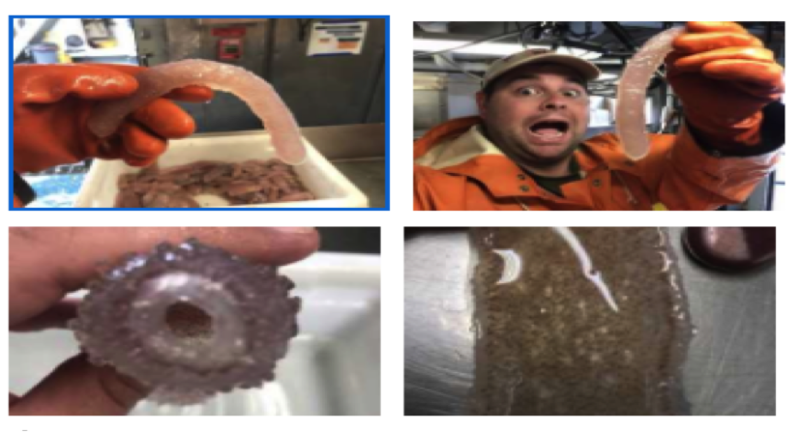 For some species, a pre-determined percentage are kept for a more detailed work up that may include the extraction of otoliths, removal of gonads, or a collection of stomach contents. 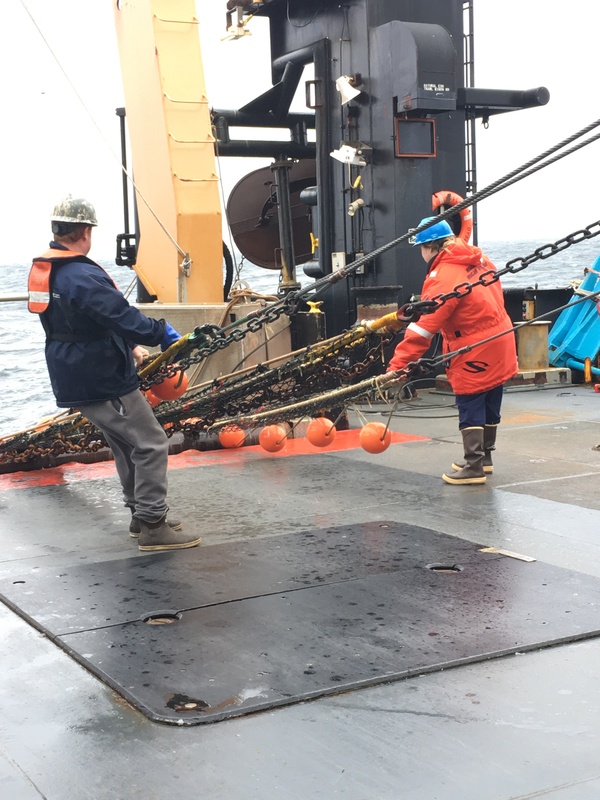 The data collected from each fish will then be used by scientists in a number of different agencies and in different states to better understand the growth and reproduction of the particular species. 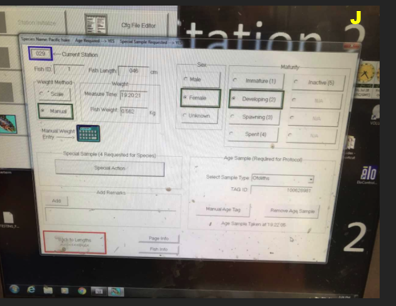 All of this data is then used to create management plans for economically and ecologically important fish as well as to gain a better understanding of its life history. One may assume that a very long fish is also very old, but that is not necessarily the case. 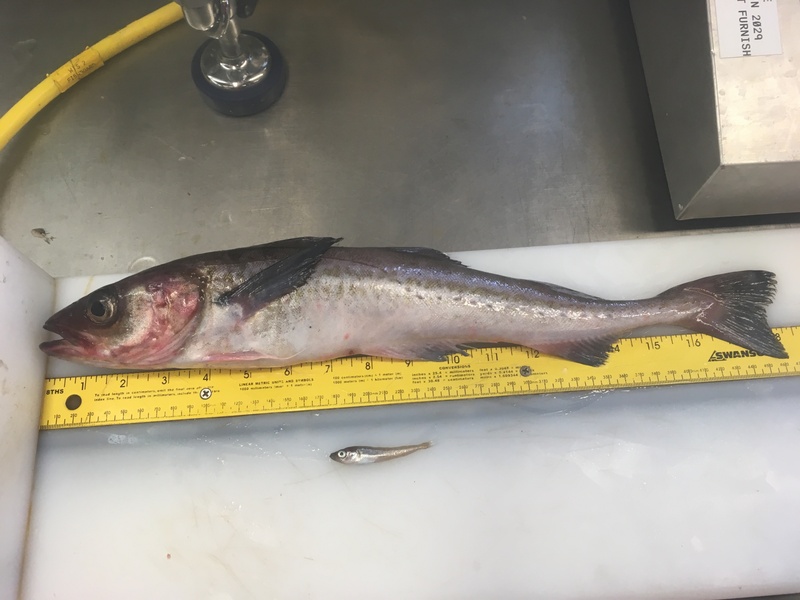 The length of a fish is not a good way to determine the age of a fish because factors such as temperature and food availability may alter the growth rate. Many fish grow very rapidly early on, but then slow their growth, so it is possible that a fish that is twelve years old is the same size as a fish that is three years old. 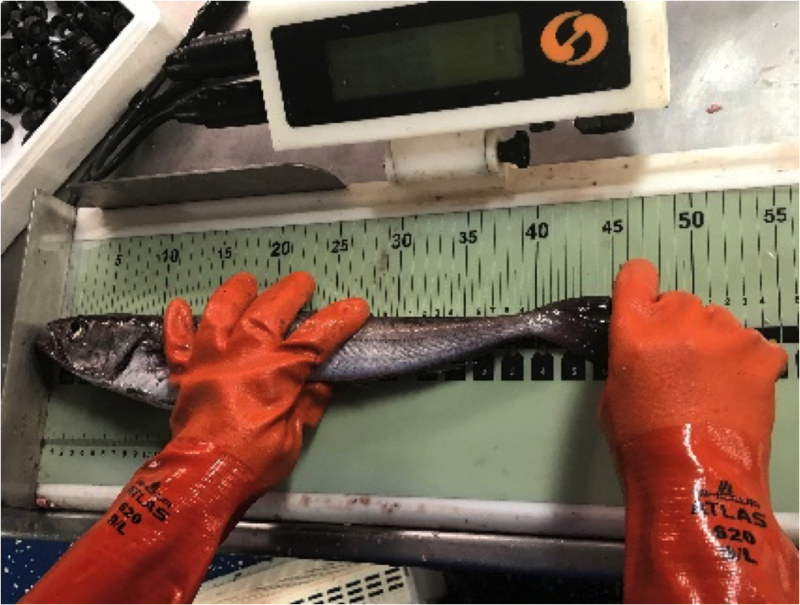 Because many fish demonstrate logistic growth rates in terms of length, it is important to use additional pieces of data to determine their age. 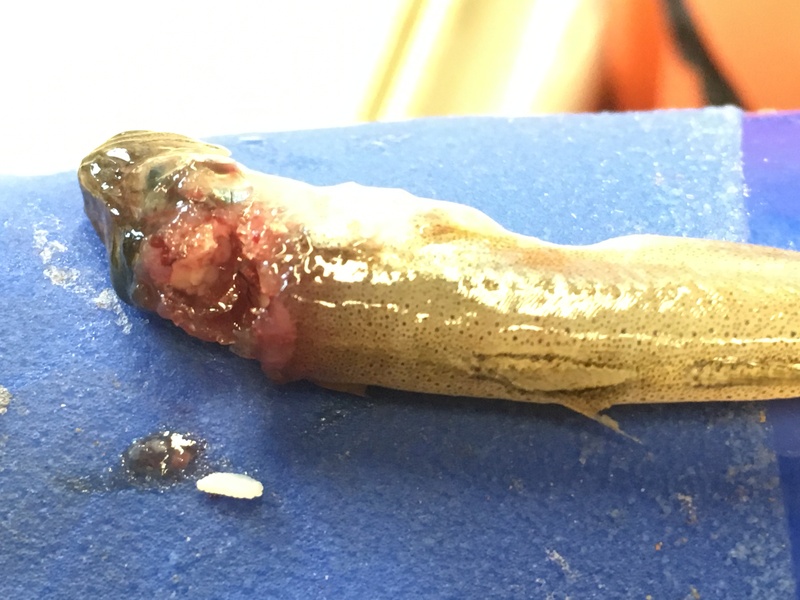 In the head of ray-finned fish, one can find small, bone-like structures called otoliths. 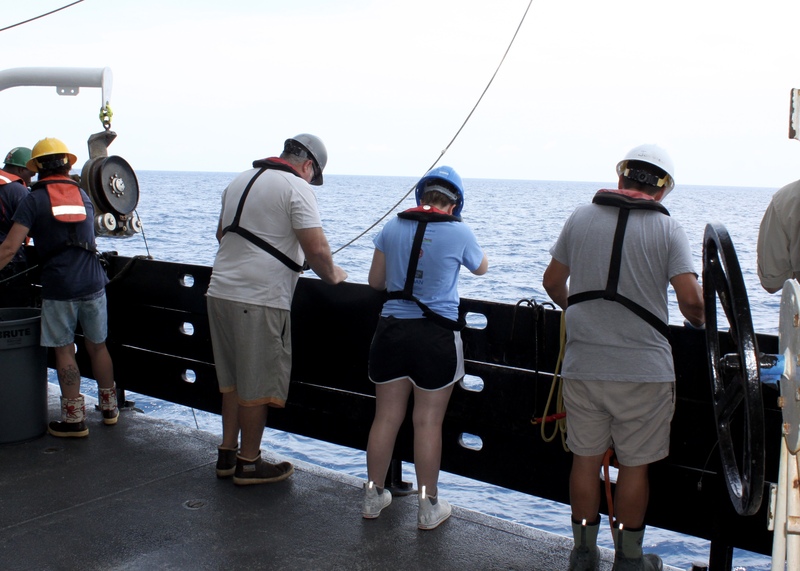 These structures have a variety of sensory functions that include detection of sound vibrations in water, movement, and its orientation in the water. 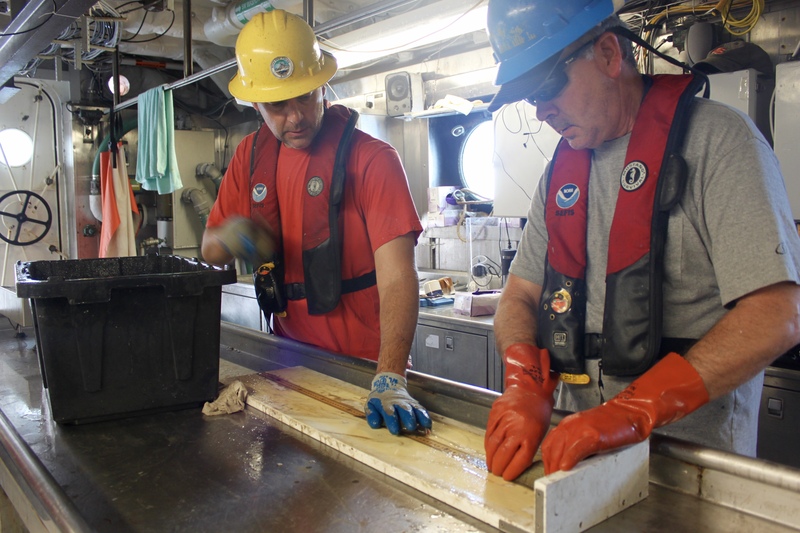 As fish age, calcium carbonate will be added to the otolith, forming ring-like structures that can be used to determine the age of a fish, much like a tree will add new tissue each season forming tree rings. 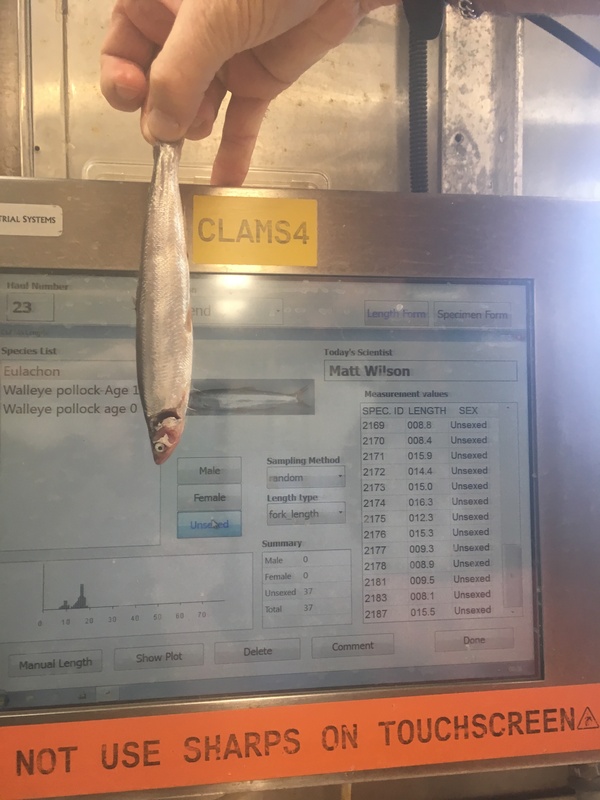 Otoliths are the best way to determine the actual age of a fish. 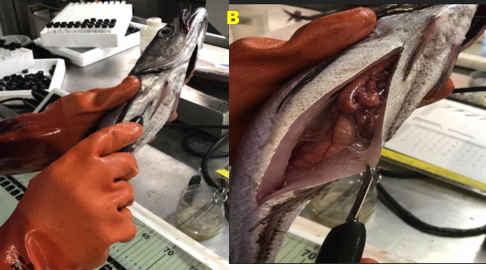 For the fish that we were sampling, we remove the sagittal otoliths which are located beside the brain just about level with the eyes. 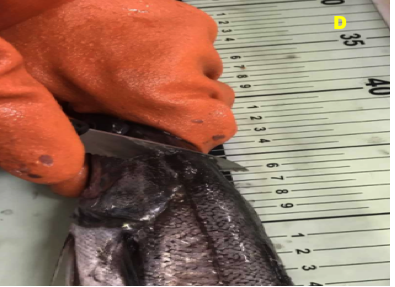 To extract them, a cut is made on the dorsal side of the fish with a sharp knife to gain access to the skull case. 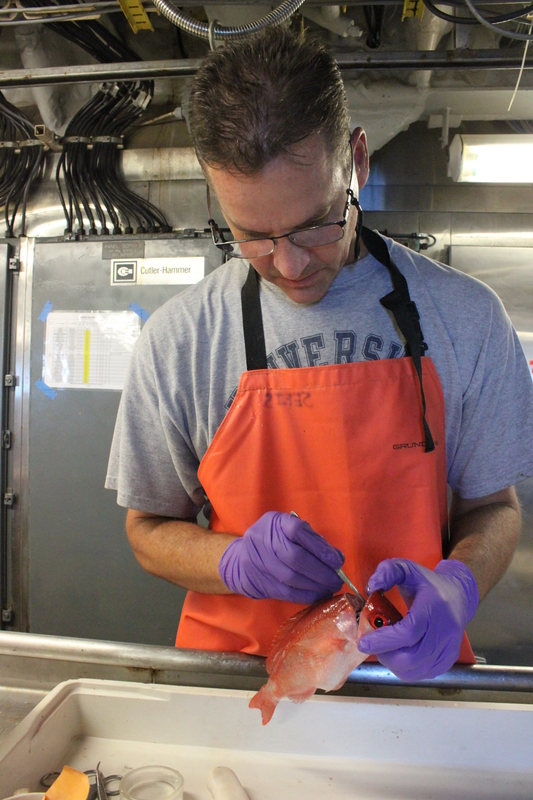 To extract otoliths from some very “hard-headed” fish, a saw is used, while others take little effort. 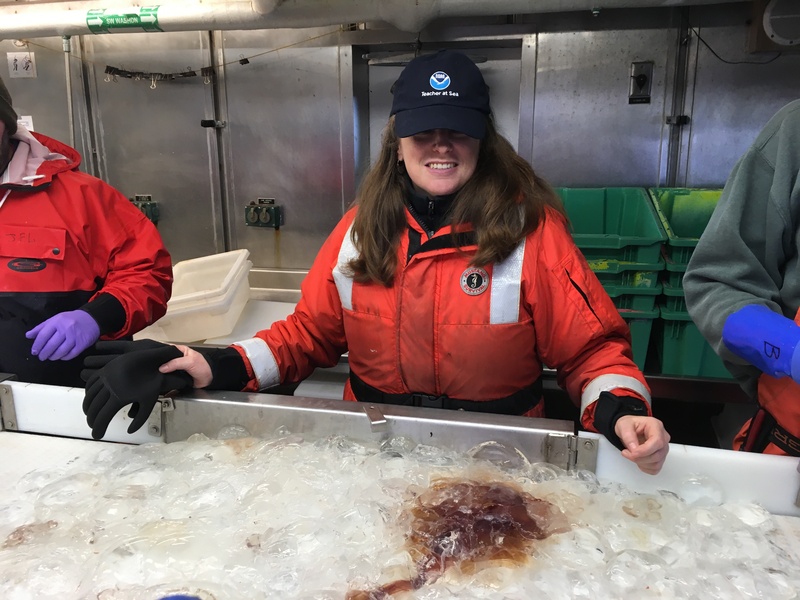 After a few hours of otolith extraction, I feel as though I am getting the hang of it, although I am nowhere near as fast as the biologist on board! 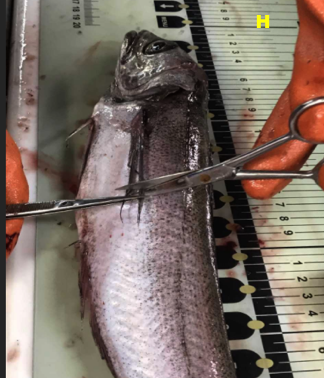 I’ve been collecting otoliths from Black Sea Bass (Centropristis striata) and Vermillion Snapper (Rhomboplites aurorubens) to bring home with me to create a lab for my class and to post on the NOAA Teacher-at-Sea website. 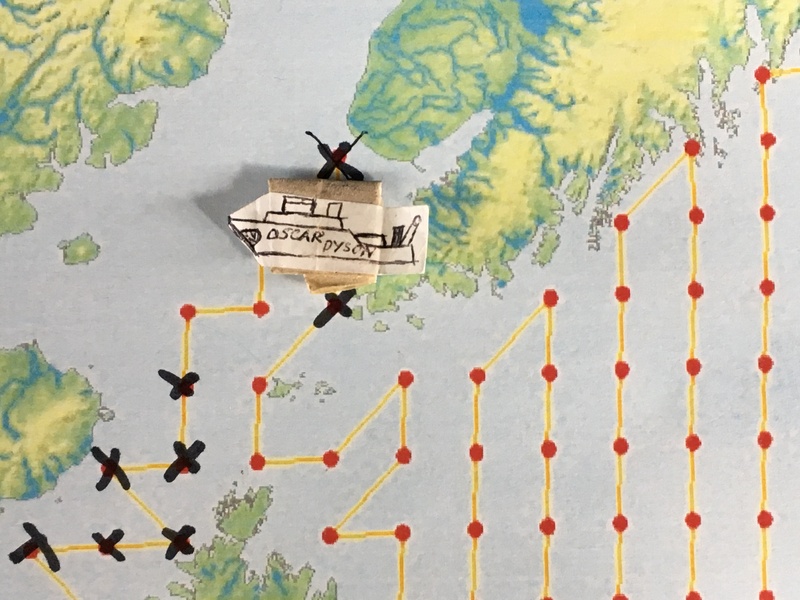 The motion of the ship has not been a problem so far and I stopped taking any motion sickness pills after the first day. 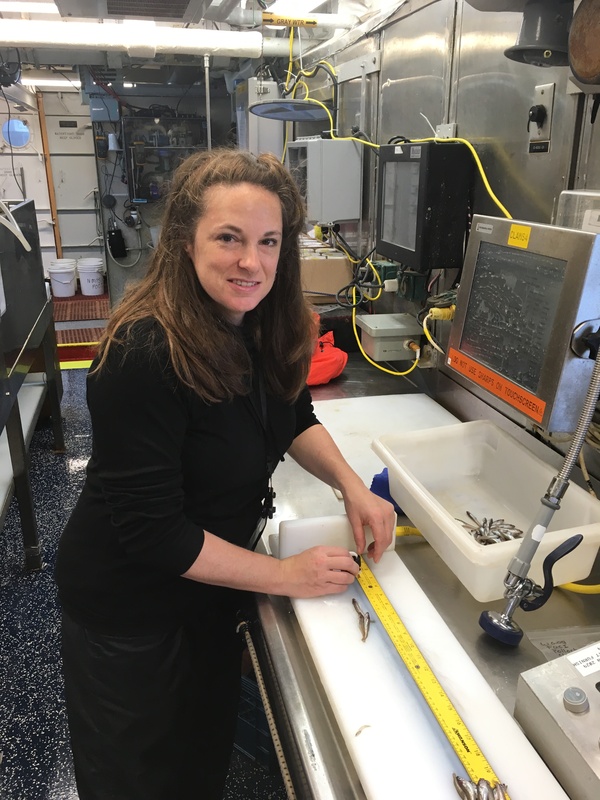 As I have been removing otoliths from fish, I cannot help but think about the similarities in how both fish and humans perceive their spatial environment and maintain balance. In our vestibular system, we too have otoliths that help to sense acceleration in a vertical and horizontal direction. Of course my thoughts then go to a dark place…what if someone were removing my otoliths to determine my age? The longest known life span in vertebrates is found in the Greenland Shark (Somniosus microcephalus). It is estimated that the Greenland shark grows less than 1 cm per year. Since sharks do not have otoliths, scientist have to analyze proteins found in the lens of their eye. In 2016, scientist from the University of Copenhagen collected a 5 m shark that was estimated to be about 392 years old, but may be anywhere from 272 to 512 years old.